Marina Keegan (1989-2012) was an award-winning author, journalist, playwright, poet, actress, and activist. Her nonfiction has been published in The New York Times; her fiction has been published on NewYorker.com, and read on NPR’s Selected Shorts; her musical, Independents, was a New York Times Critics’ Pick. Marina’s final essay for The Yale Daily News, “The Opposite of Loneliness,” became an instant global sensation, viewed by more than 1.4 million people from 98 countries. For more information, please visit TheOppositeofLoneliness.com. "Many of my students sound forty years old. They are articulate but derivative, their own voices muffled by their desire to skip over their current age and experience, which they fear trivial, and land on some version of polished adulthood without passing Go. Marina was twenty-one and sounded twenty-one: a brainy twenty-one, a twenty-one who knew her way around the English language, a twenty-one who understood that there were few better subjects than being young and uncertain and starry-eyed and frustrated and hopeful. When she read her work aloud around our seminar table, it would make us snort with laughter, and then it would turn on a dime and break our hearts." "Illuminates the optimism and neurosis felt by new grads everywhere. . .Like every millenial who's seen irony elevated to an art form, Keegan brings self-awareness to the collective insecurity of her peers even as she captures it with a precision that only comes from someone who feels it too. How unfortunate that she will never know the value readers will find in her work." "Funny, poignant, tender, and fiercely alive, 'The Opposite of Loneliness' contains the keen observations of a short lifetime—and the wisdom of a much longer one." — Deborah Treisman, Fiction Editor, "The New Yorker"
"A bittersweet, what-might-have-been book filled with youthful optimism, energy, honesty, and beyond-her-years wisdom." 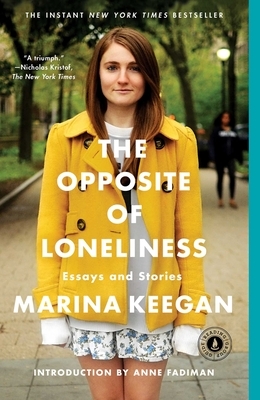 "The Opposite of Loneliness captures in both fiction and nonfiction [Keegan's] adventures in love and lust, the weird bliss of being stoned, and, as she writes, what it’s like to see 'everything in the world build up and then everything in the world fall down again.'" "Remarkable... a compelling literary voice... the appeal of this collection is its improvisational quality, its feeling of being unfinished but always questioning." "How do you mourn the loss of a fiery talent that was barely a tendril before it was snuffed out? Answer: Read this book. A clear-eyed observer of human nature, [Keegan] could take a clever idea...and make it something beautiful." "A triumph...Keegan was right to prod us all to reflect on what we seek from life." — Nicholas Kristof, "The New York Times"
"The Opposite of Loneliness does [Keegan's] talent and memory justice, both as a picture of a generation entering adulthood and as a highly personal portrait of a gifted young woman." “What a gift Keegan has left behind. Not only in her written words...but also in her legacy of social activism and fierce belief in leading a life of purpose, not privilege. "Wonderful... Marina Keegan did that thing we all want to do as writers: say what everyone else is thinking, but better." "Full of uncanny wisdom...Marina would not want to be remembered because she was dead. She would want to be remembered because she’s good. No worries there, Marina. You left us aching for more." "A talented voice, silenced too soon, endures...throughout there are reminders of the talent of this forever-22-year-old."